Keeping it safe | What Car? The safety advances are every bit as worthy, though this is hardly surprising from a company that can justifiably claim to have been a trend-setter for more than 50 years. They're led by a drowsiness detection system that monitors the driver's behaviour and sends out warnings if concentration starts to waver. Mercedes is so convinced by it that it will gradually be fitted to all model ranges. Every E-Class will also have nine airbags and a bonnet that springs up to help protect pedestrians in a collision. Unlike the similar systems in Citrons and Jaguars, you can reset it yourself without having to visit a dealer. All but fleet-oriented SE models also have headlights that progressively switch between main and dipped beam when there's oncoming traffic. 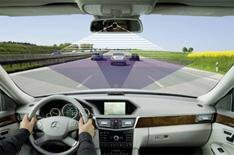 A night-vision camera, brakes that are automatically applied in an impending crash and lane-departure and blind-spot warning systems are also available.